Down below, there is a PayPal donation button. 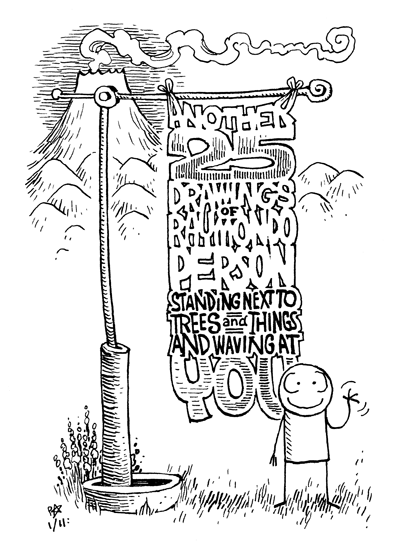 For $2.50 (or more), you will receive the high-resolution version of Another 25 Drawings of Raymondo Person Standing Next to Trees and Things and Waving at You – it’s 400dpi, versus the free version’s 150dpi. Enjoy Raymondo’s standings and wavings in exquisite detail; print out your favourite drawing to pin on your wall, and have it not look like arse. I don’t have a digital web shoppe set up just yet, so I’ll just be emailing these PDFs out. Please specify if the email address you’d like me to send the PDF to is different than the email address you use with PayPal. Also, bear in mind that it may take me a day or two to send the email. Thanks! You can email or twoot me. Q: Patrick, can I see some other of your artworks such as these ones?? A: Certainly you may, both elsewhere on this website, and in my deviantart.com gallery. Q: Heyyy, I wanted to buy some original art! Where’d it all go? A: You had six months! TOO LATE, SUCKA!